Sometimes I'll look through my wardrobe for something I want to wear and come across something I haven't worn in a while. These wrap tops haven't been worn recently and were definitely overdue a wear, so I set them aside waiting for an opportunity to wear them. I decided they would look great with my colourful jeans. The resulting outfit formulas below are exactly the same, with a wrap top, cosy scarf, skinny jeans and Louis Vuitton neverfull bag. But with the different colour schemes I think they look completely different. An early start and a busy morning meant I wanted a simple and fuss free outfit. I always enjoy this wrap top when I wear it as it's so cosy and soft. The only downside to it being chilly in the morning and needing a scarf is that the scarf kind of covers up the wrap detail of the top, ha! You can see it better the last time I wore it here. When I bought these green jeans I thought they were something to challenge me and make me try different things, as I usually find green tricky to wear. But I've been finding these jeans work with so much! I've been wearing them so frequently lately. I love blue and green together so expect to see me wearing them that way a lot more often! Sticking with simple block colour pieces makes an outfit come together really quickly. It made it a simple choice when picking a scarf to wear too, as I didn't have to worry about the family tree print clashing with the clothing I was wearing. I think the navy tree part of the print matches the shade of blue in the wrap top quite nicely too! Carried my Louis Vuitton Neverfull tote as I needed a big bag to cart everything around in as hubby and I had a busy day full of appointments and errands. 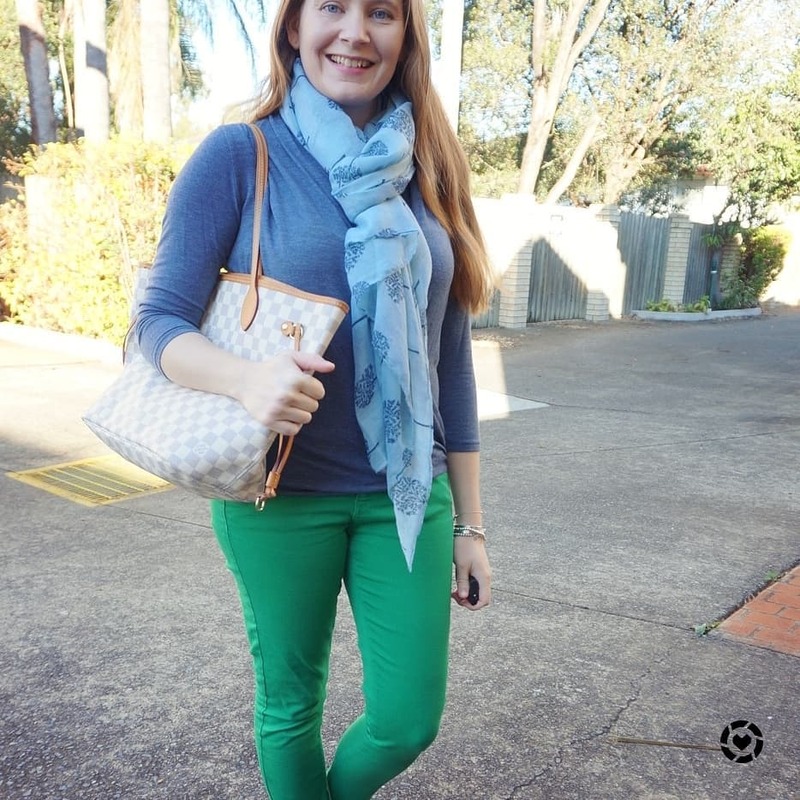 Last worn: wrap top, family tree scarf, green skinny jeans, Havaianas, Louis Vuitton Neverfull tote. Other ways to wear: wrap top and chambray skirt, family tree scarf with purple, green skinny jeans and blue knit, Louis Vuitton Neverfull tote for the beach. Perfect for pregnancy: Louis Vuitton Neverfull tote at 38 weeks. While blue and green is a fairly new colour combination for me, I've always loved red and blue together. I was quite surprised to see that I've never worn this navy wrap top and these red jeans together before! They seem like such an obvious pairing. The scarf was a last minute addition to my outfit, as the day was off to a cooler than expected start. On this morning there was a dust storm in Brisbane so everything was just a little hazy and the early sunlight was very golden! Last time I wore this poppy print scarf it was with navy and I really liked the combination, so I was happy to wear it with the same colour again. Again, the scarf does cover up the wrap design of the top a bit though! We had a busy morning with a dentist appointment for the eldest followed by swim lessons. This was an easy and comfortable outfit for all of that. The big Louis Vuitton wasn't really needed as I wasn't carrying all that much, I just thought it went nicely with the rest of my outfit. Last worn: navy wrap top, poppy print scarf, red skinny jeans, gold Havaianas, Louis Vuitton Neverfull (above). Other ways to wear: navy wrap top and denim shorts, poppy print scarf in monochrome outfit, red skinny jeans and rainbow knit, Louis Vuitton Neverfull worn 30 ways. Perfect for pregnancy: navy wrap top in third trimester, red skinny jeans in first trimester, Louis Vuitton Neverfull in second trimester. A plain blue wrap top is a really easy piece to wear - you can wear it with prints, or simply with jeans. A colourful pair of skinny jeans is a bold way to colourblock your outfit, and a fun way to wear a colour combination that you already love, or want to try out! Linking up with Fab Favourites, Weekend Linkup, Lizzie In Lace, Shoe & Tell, Sunday Reflections, Modest Monday, Start the week stylish. Thanks Lindsey! Glad I could inspire you to give it a try! I am a huge fan of wrap tops, as they are really flattering on my slightly curvier figure. And the second outfit, with the poppies on the scarf, is my absolute favorite. I love how bright and happy both of these looks are! Your red skinny jeans are fire! I LOVE them! I also love your always impeccable taste for scarves, the blue suits you perfectly of course, and the red floral one is one of my faves ever! Have a lovely weekend with your family, dear! I really like the colourful jeans, they go so well with the neutral bag! The second outfit I my favorite. I find green to be a hard color to wear as well. I have a green skirt that I have only worn once. I so need to pull it out and give it another go. You always wear colorful jeans beautifully! Both looks are cute and the print scarves pulls the looks together nicely. I pray you and your family have a wonderful weekend. I have both green and red jeans that it is finally cool enough to wear. I love pairing both of them with blues as well. Blue is my staple color to pair with anything! I think it always compliments other colors. Your scarves are fun additions to these outfits! I hope you had a great week and enjoy your weekend! I do the same thing with my wardrobe. I love how both looks came out. Colorful jeans are such a fun item to style. oooh, I love the colored jeans! Especially the red - so fun! Lovely color combo! Great colourful outfits! I love how seamless these looks are! The color combinations are perfect especially with that purse! Something I've been meaning to ask - is the Neverfull, ever full? 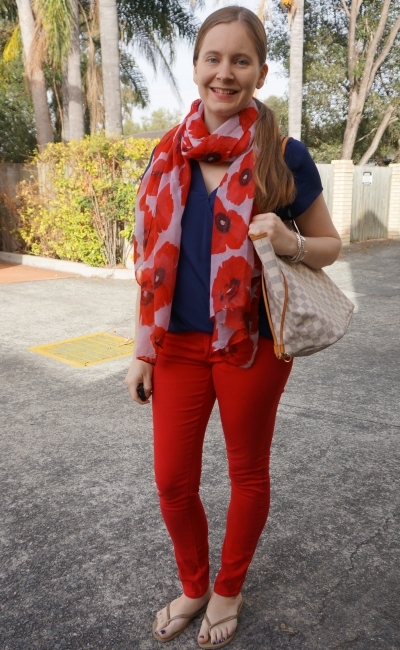 I am LOVING the poppy scarf. I haven't really been wearing scarves as of late, and I should take this as inspiration. Look at you going without a jacket or cardigan, Mica...it makes me a little jealous!! I absolutely adore that you love to wear color as much as I do!! I have a pair of green pants, and I need to pull them out more. I think of them more for the summer, yet they are a little heavier weight, and would be perfect even now. Thanks for the inspiration!! Love both of your jeans. What great colours :) The red are perfect for cheering you up on cool Autumn days. Love how brave you are with colorful jeans and the way you styled these two looks! Perfect! Wrap tops are great, it's lovely you remember you wear them again. I'm a big fan of blue and green worn together, so I just love that first outfit. Those green jeans are so cool. It's wonderful you've been wearing them a lot. As for the second styling, I think the combination of red and blue is simply perfect. The red jeans are simply perfect with that red scarf. Fantastic outfits both of them. It's beautiful in the monogram too! Such a good carry all bag! Cute wrap tops. I'm loving the blue and red pairing the best. Have a great weekend. You have a nice collection of colored jeans, I don't have either of these colors. I love that Louis V bag!! I have a wrap dress, but not a top... I need one of these! I love love the red vibe in your outfit. Your scarfs are screaming for fall , holiday and winter. They are right on spot with this year trend. I love the red pants with red scarf the most <3. I love both of these outfits! The colored jeans add such a fun pop of color! Your bag is gorgeous too! :) Thanks for sharing! 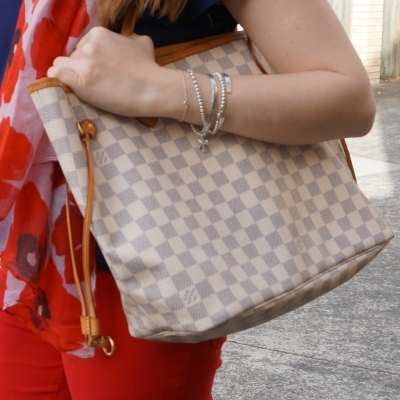 I am so in love with LV's neverfull totes. It can carry everything and big plus when it has the traditional LV prints. You're on point with the fuss-free outfit. Love that you have different scarves to match your outfit! Thanks Nancy :) it's such a great everyday bag! Love both looks but my fave is the second because of that cool scarf! I adore the contrast in this outfit. I love love your bag. So classy & totally complements any outfit. All your scarfs always make me want to seriously invest more into scarfs haha so stunning as always!! haha they are such a cheap and easy way to update a wardrobe! :) Both of these are just $10! 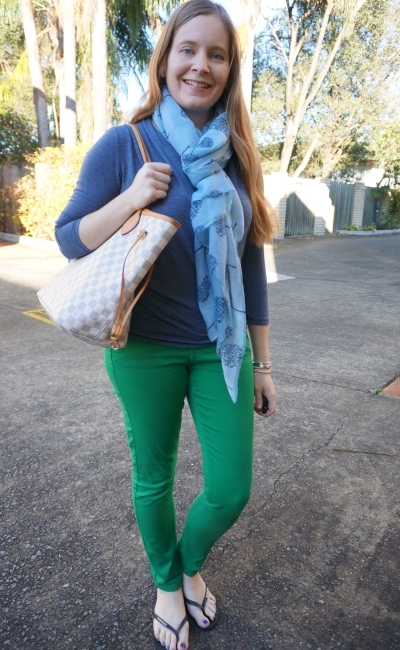 I like the bold colour jeans and how you paired them with similar shades for the scarves. Nice review of the Damier Neverfull, it really has lots of space, very practical and functional. Wishing you're enjoying a long weekend! I absolutely love your tote bag, it could go with everything but as usual, I love your styling. I love your colorful jeans and pretty scarves! Such a chic fall look dear. Love the pop of green! Blue and green is my favorite color combo! I am not a jeans lover as I am not keen on the image of blue denim but your red and green jeans look great on you and may even persuade me to reconsider my stance! You are so good at rocking those colorful pants, Mica! These outfits are so fun! These are both such great looks--you have such a fun jeans collection that goes beyond the regular blue denim. 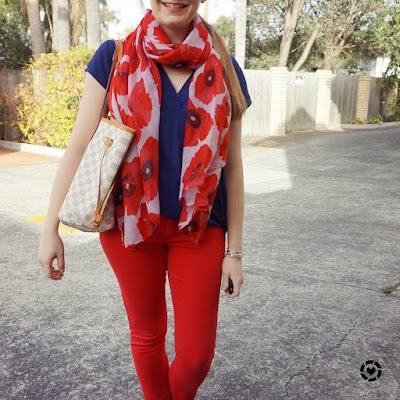 I love the red and navy look especially--the scarf really pulls it together! That bag matches so many great colors. 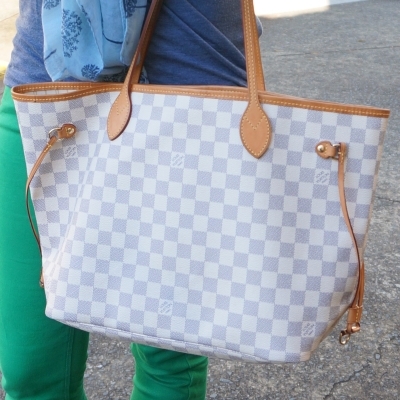 Can not go wrong with a LV tote. And that scarf with the over-sized red blooms is so nice! There is that fun scarf again ! And yes, the wallet held up really well.